Gløgg Fest 2016 is on the books, and it was a grand old time. So much so that I took almost no photos, and just kept the gløgg flowing. 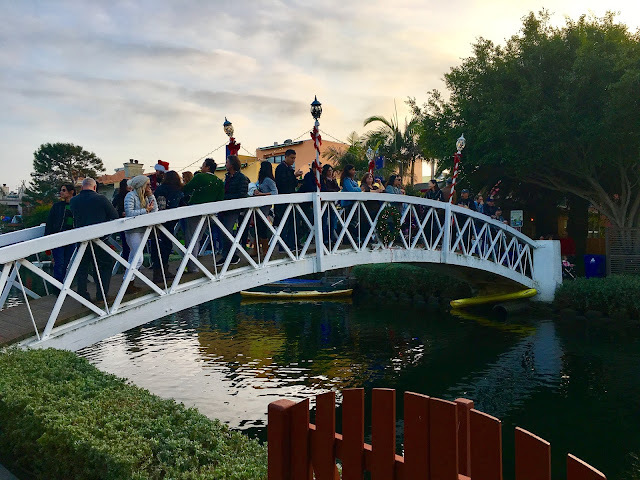 Venice always feels like such a community to me at the holidays ... we all come together to spread good cheer and let each other know how much we mean to each other all year long. At least that's how I see it. Friends came and raised a glass by the fire as we all hoped for a better 2017, and bid a kind of fond farewell to the crazy year that we're just wrapping up. Cookies help. Especially if they're cherry chip. 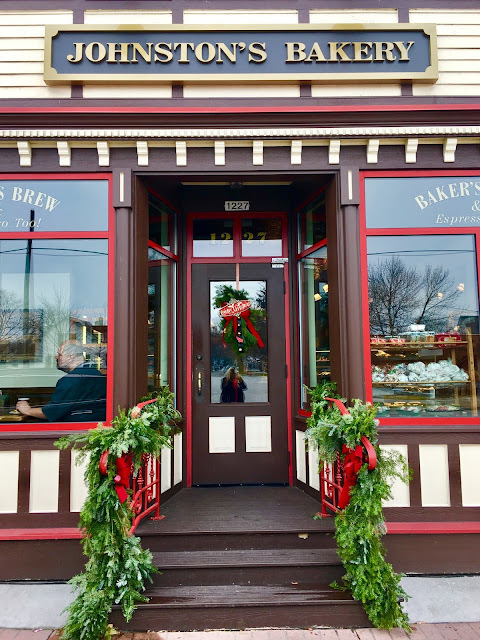 We love to share our Norwegian heritage with folks who often have never heard of lefse, and some were treated to their very first cup of the Viking mulled wine concoction we call the gløgg. Shout out to my friend Mira for bringing the true Viking spirit and sporting braids with sparkly bows. Viking horns and costumes are always encouraged. I'm heading back to the North Country tonight to be merry with the hometown crew, and feel so happy that my holiday finale in Venice was spent with such a wonderful crew of good people. To those that couldn't be there this year, you were missed and loved and felt. 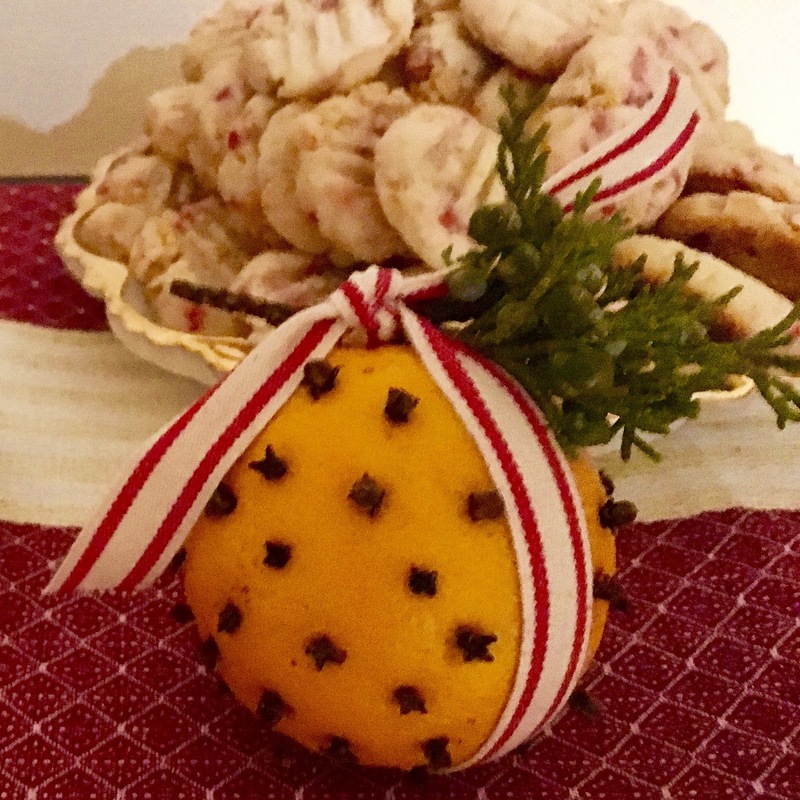 God Jul/Merry Christmas to all! Love for an incredible new beginning in 2017, with the knowledge that the People have the power to make things good. We can do it. * Group photo update coming as soon as Paul Gronner Photography edits them up! One of my very favorite annual events in Venice is the Holiday Boat Parade in the Canals. Each year locals rig up floating vessels to traverse the canal streets and bring holiday cheer to all the people lining the lining the sidewalks and bridges. 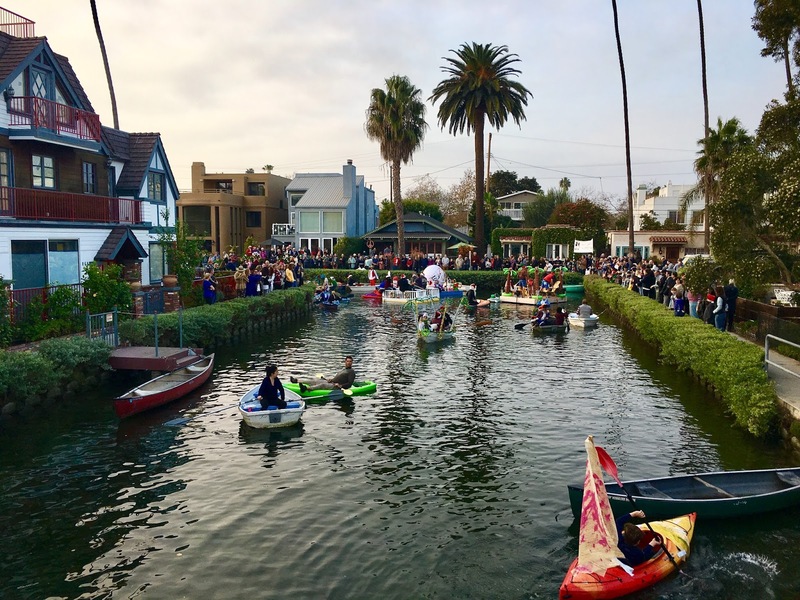 Many canal homes are hosting parties on this day, and it always seems to be a fairly open door policy, with people opening their doors to friends and strangers alike. The boats line up just before sundown, and this year seemed to be particularly packed with revelers. I think we were all ready to blow off some steam and have some holiday fun to remember this year by, instead of all the mad/sadness. It worked. The bridges were decorated in addition to the boats, and one was more adorable than the next. My choice for best bridge this year went to the charming little house facade that went up over one bridge, reiterating that this is our HOME. One house had a live band playing mainly classic rock covers and The Doors (appropriately), and the jams echoed all throughout the waterways. As most of the boats were caroling along with Christmas tunes, the absolute metal was kind of great in its juxtaposition. 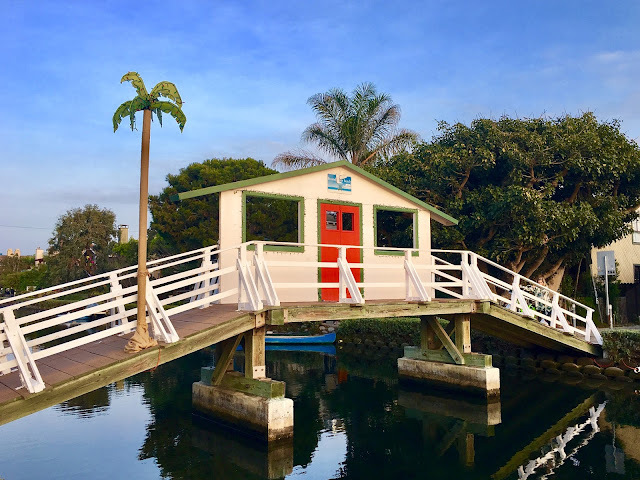 My runner up bridge was the Venice sign bridge on Linnie Canal, that as the sun set revealed lights and icicles dazzling up the colorful letters of the sign. This one was a popular photo backdrop all evening long. The parade entries were all great this year, with a palm tree chill pad and a floating stage with a lounge singer trio competing alongside a floating manger scene and a dove offering world peace (my favorite), among many others. Battery life on lights and iffy floatability made some entrants more precarious than others, and soon a friend of the manger scene had to jump in to tow the floating creche back to its dock. That is some serious community support. My dear friends, the Revelins, were again our gracious hosts for the parade, which was even more generous of them this year as they had lost their beloved little dog, Lola, just the day before. 2016, Man. But, as in the general atmosphere of the country, the show must go on. We have to make the best of it all. We have to remember the good within the bad. We have to come together to create joyful moments that radiate so much light that the darkness is obscured, especially during the holidays where the important things are meant to be more illuminated. 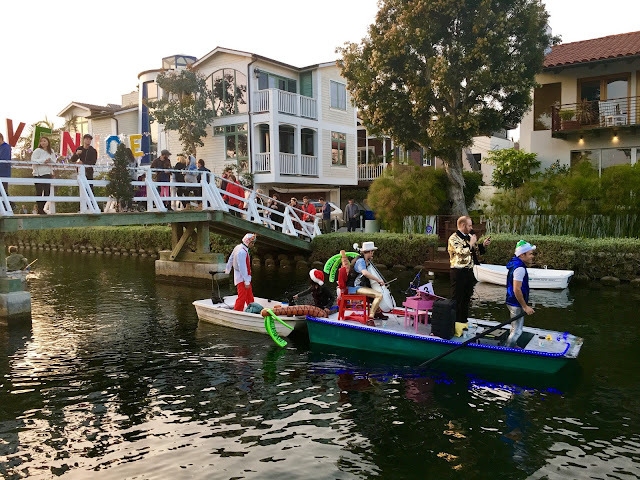 The holiday spirit was tangibly felt, as people walked by with their roadies and shouted greetings to the boats and the house partiers. One group shared their 3D glasses with us, and it definitely made all the Christmas lights look even more enchanting. As did the wine. 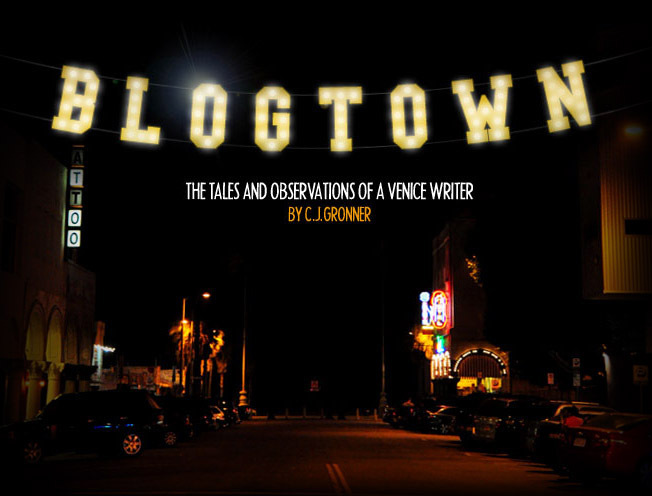 As the skies darkened, the lights came on, and the entire Canal district was twinkling. 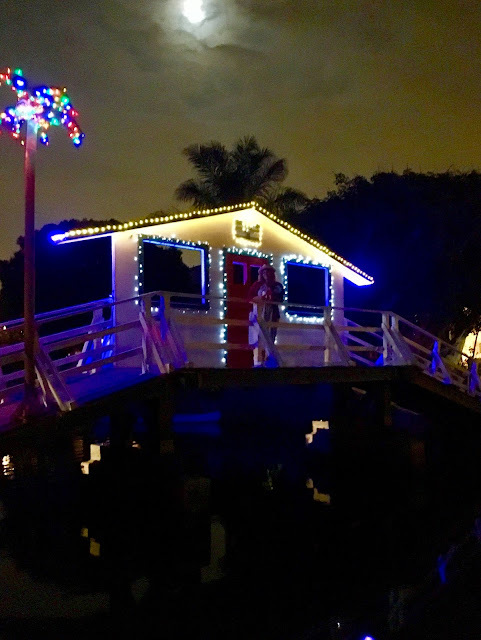 The little house facade on the bridge lit up, and the moonlight shone down on it, bringing this year's theme "Where The Palm Trees Glisten" beautifully into reality. It was all so pretty and enchanting that it was difficult to tear ourselves away, but a whole bunch of friends (Blue Eyed Son, Lacey Cowden, Matt Ellis, DJ Bright Moments, National Anthem) were all playing at The Cinema Bar, and we had to get there for more holiday cheer (and to celebrate this dang year being almost over). 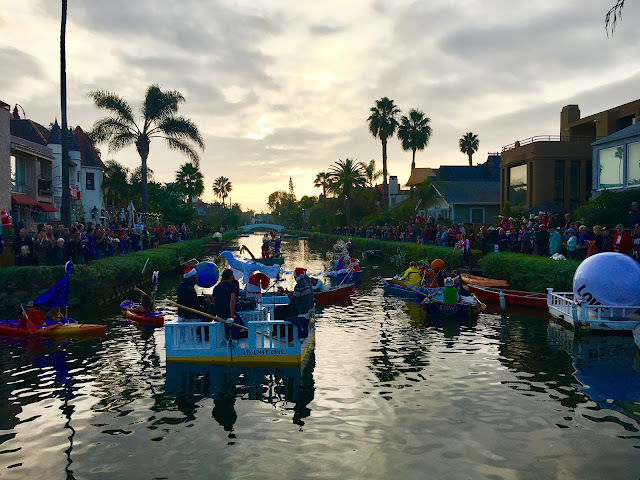 I'm now all the way in the Christmas vibe, and I have the Venice Canals Holiday Boat Parade to thank. 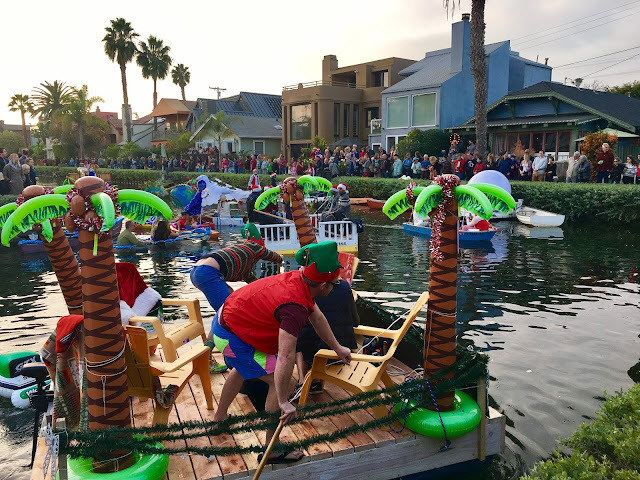 There's no way you could be standing there, watching all the fun and wholesome holiday hijinks, without feeling your heart swell with the happiness that the holidays - and Venice itself - brings to your soul at this event each year. Thanks so much to everyone involved for making it such a special and beloved holiday tradition for Venice and our friends. 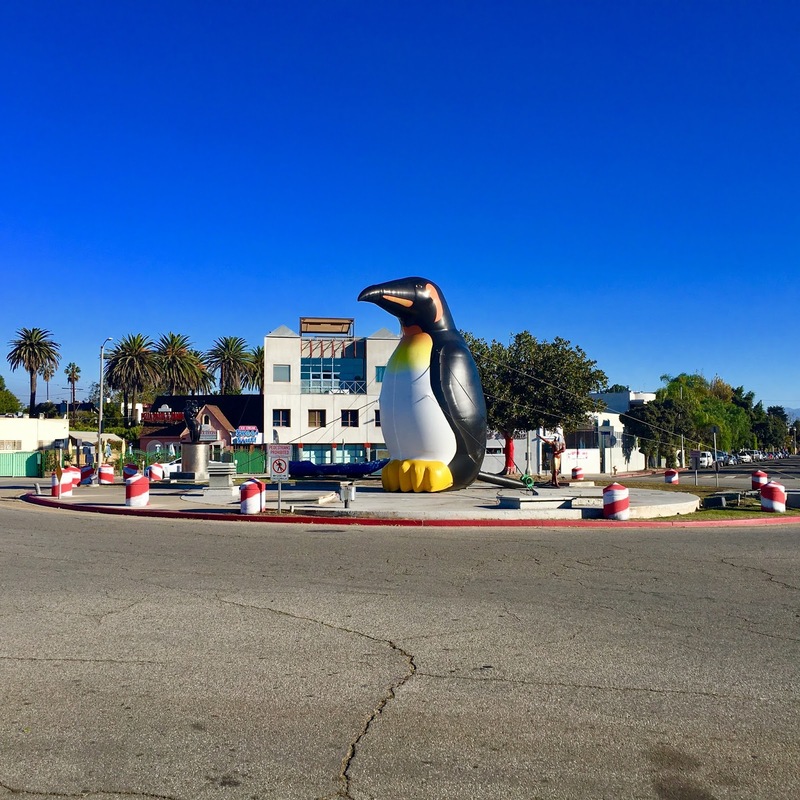 The Christmas Penguin (!) 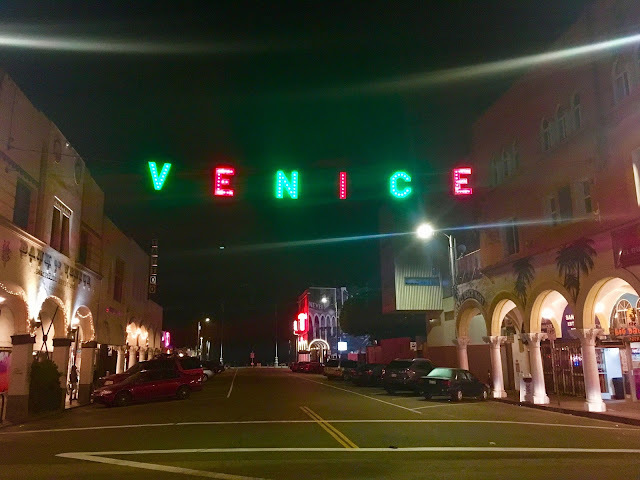 has arrived in Venice just in time for the Venice sign lighting tonight! Sadly, I'm leaving town right now and will have to miss one of my favorite events of the year, as Venice becomes Bedford Falls there in the Windward Circle ... I just love it. I hope you all have so much fun, and please know that I'm fully there in spirit! Happy Holidays, Venice! It's on. Cool. Harder told me that Har Mar called him on a Friday saying he wanted to do a video floating down the Mississippi River while the fall colors were still in all their glory. 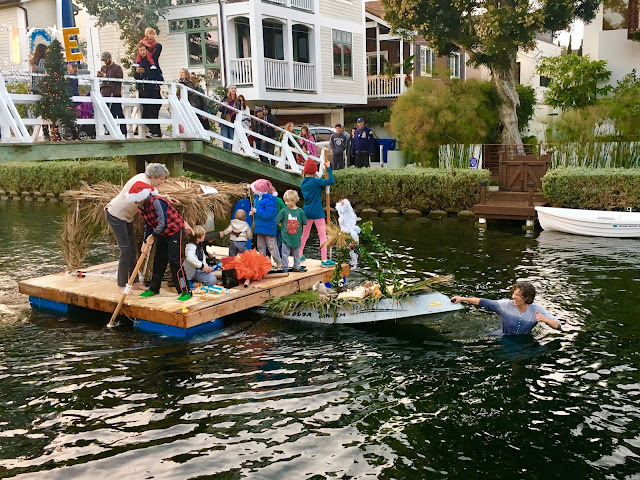 They shot the following Sunday, after quick building a wonderful Huck Finn type raft/boat that Harder's wife Isabelle fitted with mirrors for Har Mar to stand on, giving it all a beautiful, reflective, mysterious wonder. Harder shared a making of video with me that showed how the magic was created, showing just how very close Mr. Superstar was to falling into the Mighty Miss. Many of the shots had Harder propping him up from below for safety purposes, as Harder told him, "Act like you're on a stage, but we're not." Interestingly, the iffy balancing act was because they had to go fast to create the slow motion effect. Some shots were also flipped in post. Simple (but not) as that. I love every frame (especially going by the Grain Belt sign and the bridge with a train going by). I also love the tune itself. Aside from its cool oldie crooner style, with so much bad news going on every day, it really does beg the question some days of how in the holy hell did I get through today?! But you somehow did. Songs like this help. Beauty as seen in this video helps. 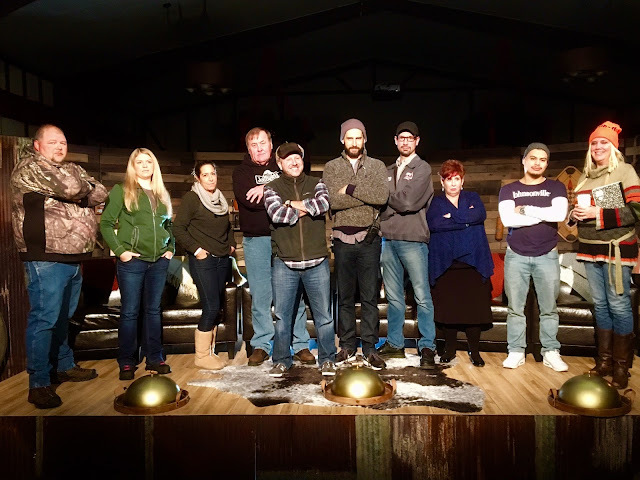 Awesome people coming together to create something fantastic really helps. Shout out to Har Mar and Harders (and crew) for this very special piece of work. And for helping me get through today.